Photos: Shashi Kapoor's Ancestral Home City Mourns The Actor's Loss! Home BOLLYWOOD Photos: Shashi Kapoor’s Ancestral Home City Mourns The Actor’s Loss! Shashi Kapoor's Ancestral Home City Mourns The Actor's Loss! Ancestral home city of the Kapoor’s— Peshawar mourns Shashi Kapoor’s loss. 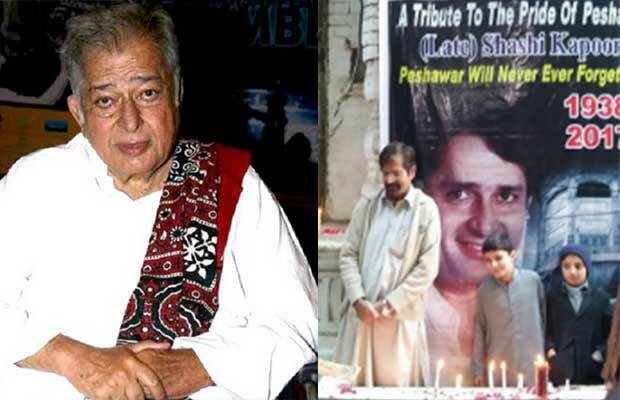 A candle vigil was held in honour of Shashi Kapoor outside his ancestral home in Peshawar. The Kapoor Haveli was built before India-Pakistan partition. The construction of the Haveli started in 1918 and ended in 1922. It was built by Dewan Basheswarnath Kapoor. Dewan Kapoor, Prithviraj Kapoor’s father was the first member of the Kapoor Khandaan to enter Bollywood. Shashi Kapoor, Randhir Kapoor and Rishi Kapoor visited their ancestral home in the 2000s. Lovers of Hindi Cinema and many more attended the event. Cultural Heritage Council’s secretary Shakeel Waheedullah stated that it was love for their roots that brought Shashi Kapoor, Randhir Kapoor and Rishi Kapoor to Peshawar. He further added that the people of Peshawar have love and respect for the Kapoor family. Along with other actors that belong to the historic city. Actors like Shah Rukh Khan, Dilip Kumar, Vinod Khanna, Anil Kapoor and Amjad Khan have their roots in Peshawar. Historian Mohammad Ibrahim Zia was at the event too. Zia is famous for his ‘Peshawar Ke Fankaar’, a book on actors and singers who hail from Peshawar. Zia highlighted that the Kapoor family sold their home and shifted base to Mumbai post the partition. Still the family always fondly remembered their previous home. Zia recalled meeting the Deewar actor in 2014. Despite being ill, the happiness on Shashi Kapoor’s face was obvious. The historian added that members of CHS will soon visit India to convey the condolences of the people of Peshawar to the Kapoor Family. Meanwhile here, Bollywood celebrities have thronged in the time of need for the Kapoors. Amitabh Bachchan penned an emotional blog post recalling his time with his Deewar costar, Shashi Kapoor. Watch: Shashi Kapoor’s Body Draped In A Tricolour, Bollywood Celebrities Bid Emotional Farewell! Next articleArjun Kapoor’s Family Panicked Over Reports Of Him Being Assaulted, Actor Reacts!